Ok... so i have two things i need to address real quick. First, that last post was a little aggressive. Sorry about that everyone. I think it was just a particularly disappointing root beer in a long string of inadequate root beers. My apologies. Second, i've been reviewing some of the comments and found that i had about 50 or so in various reviews that were spam comments with generic text and a link to some product or service. I have deleted and marked those comments as spam. Knock it off people. This blog takes itself very seriously. Anyway, i have at least one more generic in my fridge, but i wanted to break the cycle and go to some of the bottles i have been storing. I want to get through these before i place my next order for more root beers from various online soda sites. This is one of the ones i got from The Soda Emporium over a year ago. The ironic thing is that i visited a Rocket Fizz candy store location in Thousand Oaks, CA and didn't find this root beer there on the shelves. I had to go online to get it. These Stores are popping up all over. 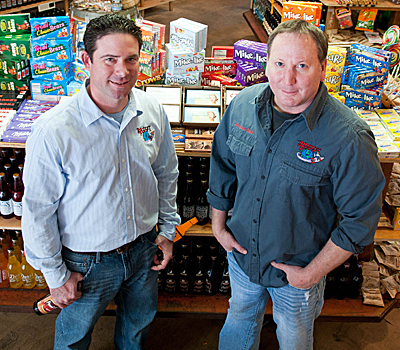 Ryan and Rob founded the candy store and sell vintage candies and sodas as well as new originals. I actually met Ryan (the guy on the left) on my visit and he strongly encouraged me to open a franchise of my own in Arizona. Unfortunately, i don't have the resources or wherewithal to open and run a candy store, but it looks like these guys are aggressively expanding. There actually is a store open now in Arizona and even one out here in Florida not far from where i now live. Maybe if it's something you're interested in, you should open one. The clear 12 oz bottle has a foil sticker label with the logo of a kid riding on a rocket around the world and some simple text on it. It looks professional and not cheap or inexpensive. 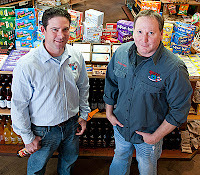 Pictures on the website show that the store locations are often set up with a '50s and '60s spaceman decor. They are really trying to capture the vintage candy crowd. I have no criticism on the label. It's pretty decent. This root beer is labeled as "Root Beer Float" flavor, but that's a bit of a stretch in my opinion. I don't think it tastes all that creamy, which is one of the defining characteristics of a root beer float. It just kinda tastes like root beer. You can see from the picture of the clear glass bottle that this root beer is fairly translucent and does't have a deep brown color. I usually find root beers in this category to be a little weaker in taste, and i have to say this fits the bill for Rocket Fizz. It's not bad by any means. It's sweetened with pure cane sugar and has a decent root beer flavor (lacking in creaminess i might add). But it's pretty watery and the flavor dissipates quickly. I enjoyed it as i drank it, but was ultimately left a little unsatisfied when it was finished. My official review is that Rocket Fizz Root Beer Float gets 5 (five) IBCs. I dig what these guys are doing with the candy store. Good for them. It's obviously popular because they are growing like crazy. And i appreciate that they are producing their own original line of sodas, even if one of them is based on Snooki. When producing sodas under your brand, I realize that sometimes this means putting out a product that may not be your top of the line best work just to increase the catalog of available products. But if you're gonna put your name on it i think you should make sure it's gonna change the game. I was hoping for a better showing from you Ryan and Rob. Maybe rethink this one so you can make a root beer that really stands out.